When you open a new window in AccountEdge, it’ll open at its default size in the centre of your screen. Changing the window sizes and locations speeds up productivity and gets AccountEdge working for you – not the other way around. 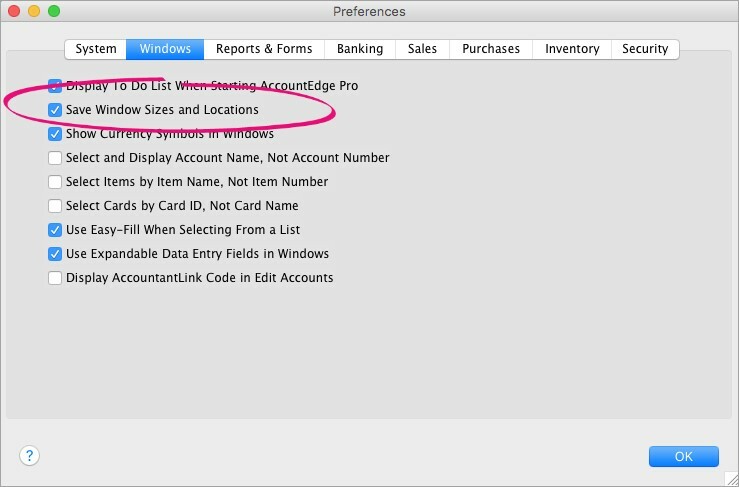 Best of all, there’s an AccountEdge preference which saves these changes (Setup > Preferences > Windows tab). This is handy if you use multiple monitors. You could open the sales window on one monitor, and the purchases window on another and best of all, your changes will be saved for next time. The stamp appears on customised forms only. 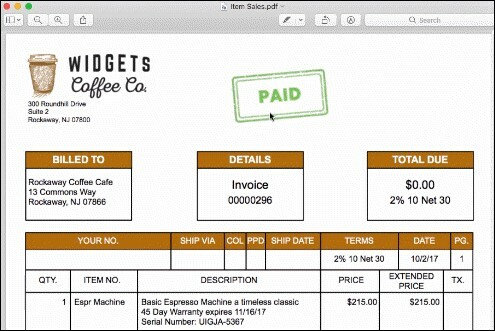 Once you’ve added the stamp to a customised invoice or purchase order, it will automatically appear only if the invoice has been paid in full. Nifty, eh? For more information, see this help topic. The security of your business data is critical. If you post GL journals from RetailManager v12.5 to MYOB AccountRight, you’ll need to install an important RetailManager update. This update ensures RetailManager communicates with AccountRight using the latest security protocols. Backing up your data regularly and at important times (like the end of financial year) means your company data is safe. And let’s face it – your company data is pretty important. Backups also provide a way of accessing historical data. Backing up couldn’t be easier: File menu > Backup. Two easy clicks that could save you a lot of grief. AccountEdge also has the option of backing up to Dropbox, an online storage service. This means your backups are safe in the cloud, and accessible anywhere anytime. See AccountEdge help for details on backing up and restoring company files. Here are a few common AccountEdge shortcuts you can use to speed up data entry. 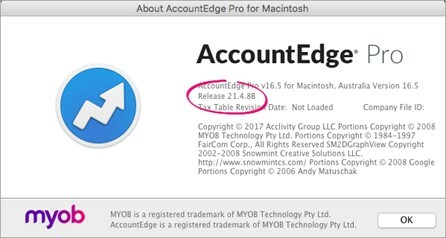 If you’ve already submitted the EMPDUPE file to the ATO, you won’t be able to generate an amended EMPDUPE file from AccountEdge. Instead, you’ll need to complete a manual payment summary form (available from the ATO) to lodge the updated information. On this form you’ll need to place an X in the box indicating it’s an amended payment summary. You’ll need to check the pay slip email address entered in the Payment Details tab of the Employee Card window. See Entering employee payroll information. Handy if you need to restore your file to produce amended payment summaries after you close the payroll year. 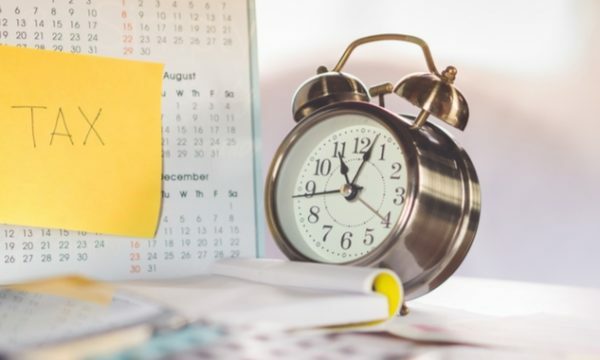 You’ll be prompted to back up your file when you close your payroll year. For more information backing up, see Backing up and restoring company files. This will prevent anyone from inadvertently making an entry in a period in which you don’t want new entries. This is a good habit to get into as part of your regular month-end tasks, as well as EOFY. For more information, see Lock periods. In AccountEdge 17 you can now attach a document to the Bank Deposit window. After creating a deposit slip, scan the deposit slip and attach it to the deposit for easy access to the details of the deposit. 1. From the Banking command centre, click Prepare Bank Deposit. The Prepare Bank Deposit window appears. 2. Click Attach. The Attached Documents window appears. 3. Click Attach. The Open window appears. 4. Select the document or image you wish to attach to this record. 5. This procedure will create a copy of the document you have selected. If you wish to make a link to the original source, select Attach document as a link in this window. 6. Click Open. The Attached Documents window re-appears. The document is listed under the Name column. If you selected Attach document as a link in previous step a check mark appears under the Link column. 7. Enter all applicable information regarding the document you have attached. 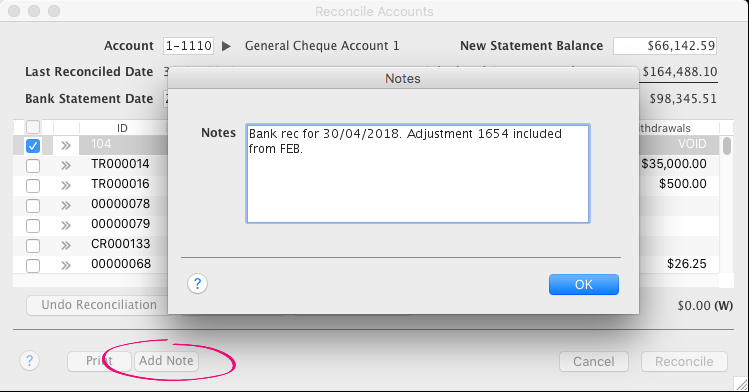 In AccountEdge 17 you can add notes to your bank reconciliation which are included in your reconciliation report. You might want to mention adjustments or if something extraordinary happened. In the Reconcile Accounts window click Add Note. Add your note and click OK. When you look at your Reconciliation Report the notes will be included at the bottom. It can be hard to keep a track of the source documents for your bank deposits once they’re filed away. 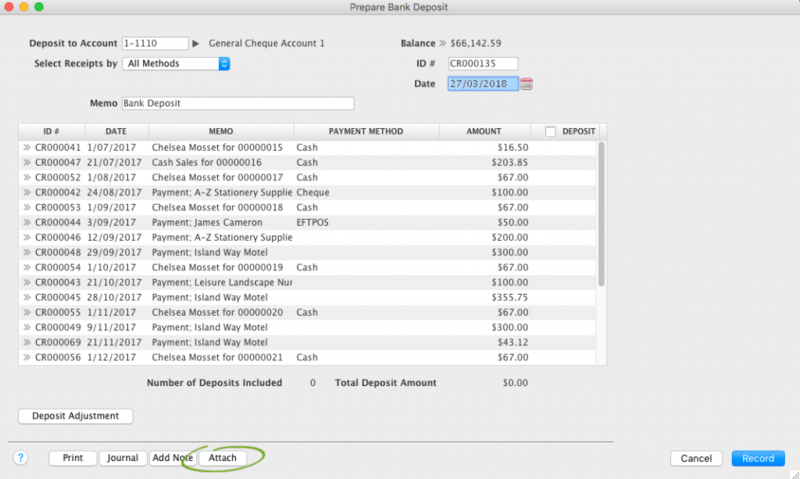 But now you can now attach documents like receipts to the Prepare Bank Deposit window. After creating a deposit slip, scan the deposit slip and attach to the deposit for easy access to the details of the deposit. Uttering “Open sesame!” worked for Ali Baba and the 40 Thieves, but sometimes opening an AccountEdge company file can prove a little trickier. AccountEdge company files have a “.myo” file extension (for example MyCompanyFile.myo). If the file extension isn’t .myo, it’s not an MYOB company file. 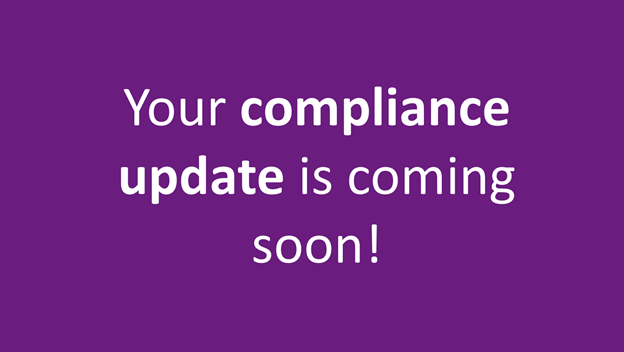 Make sure it’s not a company file from MYOB AccountRight, our Windows PC software. These company files also have a .myo file extension, but won’t open in AccountEdge. If it’s definitely an AccountEdge company file, try renaming it (ensuring you retain the “.myo” file extension), and keep the file name under 24 characters. If you’re using AccountEdge Network Edition, stop and restart FileConnect then try opening the file again. This can occur if the company file has been copied from a removable storage device, like a USB stick. Go to the location on your computer or network where your company file is stored. Hold the Control key on your keyboard and click once on the company file. Choose the Get Info option. Ensure the Locked option is deselected. Still can’t get in? Check this support note for additional troubleshooting. There’s a set of default comments that come with AccountEdge. You can modify these or add some more. Access the comments from the Lists menu > Sales & Purchases Information > Comments. For all the details, see this AccountEdge help tip. On 26 September Apple is releasing its latest MAC operating system: OS X 10.13 High Sierra. 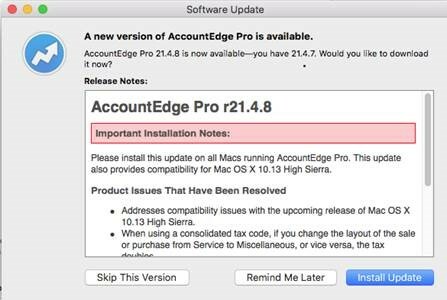 If you’re using the latest AccountEdge version, you might need to install a small patch to ensure AccountEdge is compatible with OS X 10.13 High Sierra. Just click Install Update to make it happen. If no update message appears, you’ve probably already installed it. To check, go to the AccountEdge menu and choose About AccountEdge, then check the Release info. After installing the update, AccountEdge Pro and Network Edition will be Release 21.4.8. If you have already submitted the EMPDUPE file to the ATO, you won’t be able to generate an amended EMPDUPE file from AccountEdge. Instead, you’ll need to complete a manual payment summary form (available from the ATO) to lodge the updated information. On this form you’ll need to place an X in the box indicating it’s an amended payment summary. The end of the financial year is a busy time for everyone, so who wouldn’t want a helping hand? If you run into trouble, visit help.myob.com for access to all our videos, help articles, tips and troubleshooting info. The community forum is also a great resource with hundreds of experts who are happy to share their insights and answer your questions. Process your next super guarantee early (before June 30), to qualify for a tax deduction in the 2016/17 year! To do this, simply submit your super payments via PaySuper, or MYOB’s super portal by MYOB’s processing deadline of 25 June. Find more great EOFY tips and tricks to help you through at our EOFY hub. There’s an awesome new feature in AccountEdge which makes it easier to manage credits and debits. 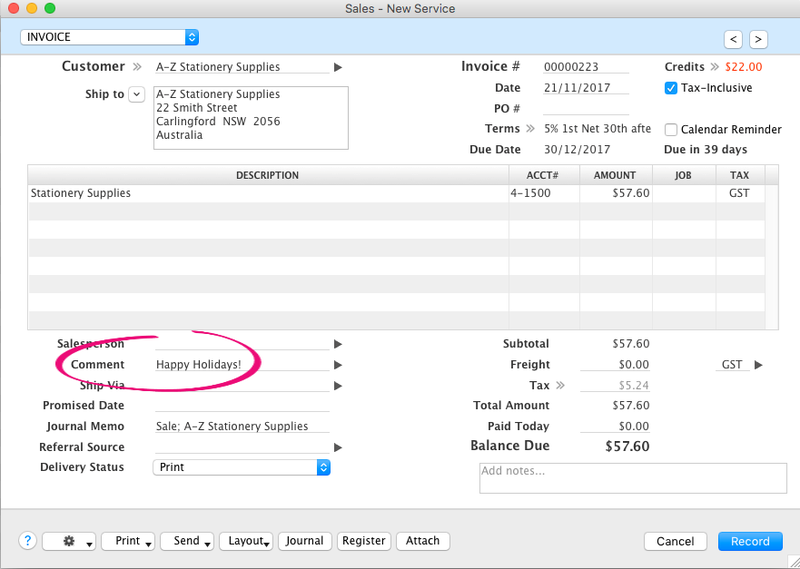 When entering an invoice, if the customer you’ve entered has credits on file, the total amount of the credits will appear in the upper right hand corner of the invoice. You can access the credits by clicking on the zoom arrow before the amount. The Sales Register – Returns & Credits view will appear showing a list of the credits on file. You can then apply the credits to the invoice or pay a refund. Upon recording a sale, if the preference is set to warn you if a customer has an outstanding credit when recording a sale, you’ll have the option to apply the credit to the sale being created. When entering a purchase, you’ll have the same options to view the open debit amount on the purchase as well as apply the debit to this purchase or another purchase. See the AccountEdge help page to learn more about customer credits and supplier debits. 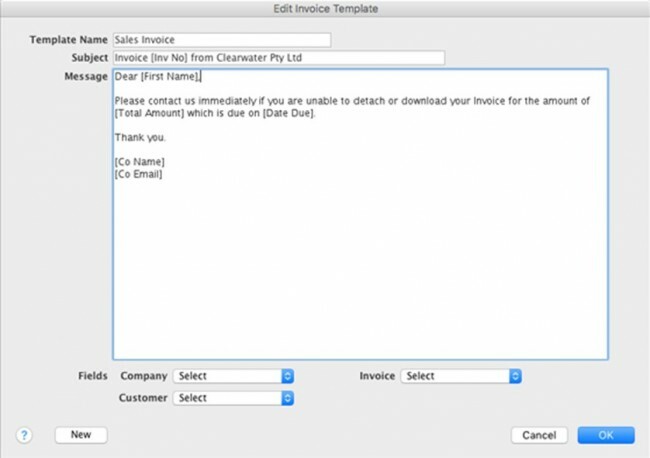 In the latest versions of AccountEdge (AccountEdge Pro/Network Edition v16 and AccountEdge Basic v5), you can customise the templates used when sending emails. This lets you add that personal touch to your emails, which better reflect you and your business. Not only can you personalise your email subject and message, but you can now include data fields (bits of information from your company file, like a contact’s [First Name] or your [Co Name]). 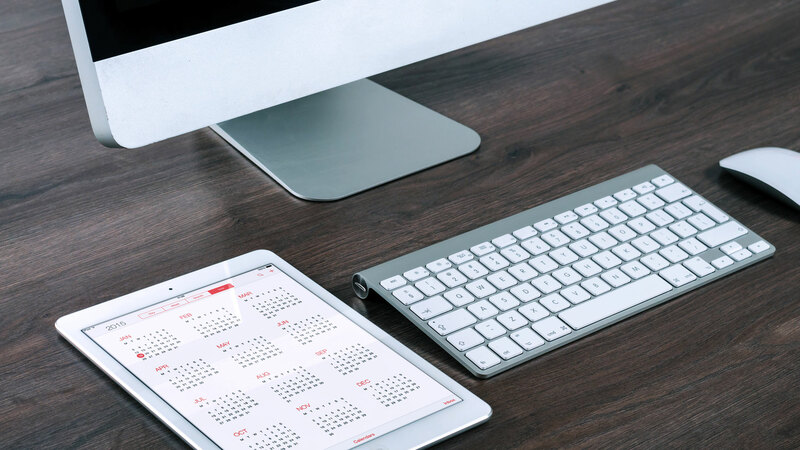 Email templates can be created for sales, purchases, statements, receipts, payment notifications, pay slips as well as a new set for emailing anyone from the Card File. You can set up as many templates as you like, and choose the template you want to use when emailing. For more info on email templates, and all the new features in the latest AccountEdge, see the help centre (Australia | New Zealand). For example, let’s say a customer has purchased a $129 coffee percolator on the account they have with you as a supplier – only now they decide to return the item for a full refund. First, enter a negative sale. When entering the sale, choose the same stock item, and enter -1 for the quantity (making sure that the price is the same price that it was originally sold at). In the Payment Details section, choose Account(as you would have done for the original account sale). When the sale has been recorded, there’s one last step: pay these two sales against each other so they disappear from the Debtor Payments window. 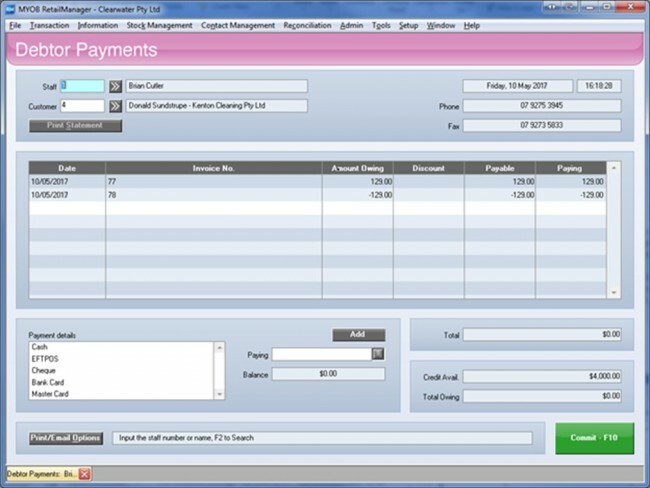 Press Shift+F6 or choose Debtor Payments from the Transaction menu. Enter your staff number and the customer’s number. You’ll see both transactions listed: one for $129 and one for $-129. Now just pay $129 on the first line and $-129 on the second line (as shown above). Commit the transaction without selecting a payment method. This will clear both of the transactions from Debtor Payments, without you needing to receive any payment. From 1 January 2017, tax rates changed for working holiday makers who are in Australia on a 417 or 462 visa. This new tax rate is commonly known as the ‘backpacker tax’. To use this new tax rate, you needed to register with the ATO by January 31. If you didn’t register but need to pay working holiday makers, you’ll need to assign them the applicable Foreign Resident tax table. If you’re not sure which tax table to use, check with the ATO. For all the details on setting this up, see our help topic Withholding the ‘backpacker tax’ in AccountEdge.